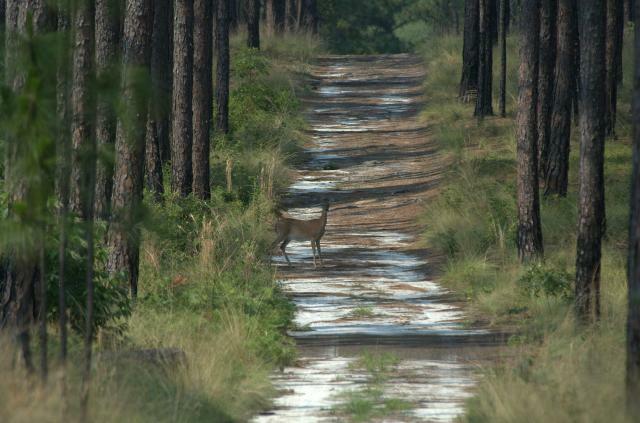 In what seems like another lifetime, I used to work all over the Eastern and Southern portion of the State and when I was in the Sandhills area I would occasionally do some running on the trails of Weymouth Woods-Sandhills Nature Preserve. A couple of years ago Marie Lewis from the Mangum Track club started putting on a 100k trail race there. It didn't fit my schedule at the time but now with the 3rd edition planned for next January, I have entered and look forward to having some fun while getting in a long race in preparation for the Umstead 100 next Spring. I've been wanting to go and check out the trails again and this afternoon I had the time so I made the drive down from Durham when I finished work this morning. It was a beautiful afternoon in the upper 60's with low humidity so I was in for some nice running weather. The biggest challenge was going to be figuring out the race course. I had a copy of the map but there would be no markings other than the normal trail signs. The problem is that the course uses several different trails as well as some bridle trails. To make it even more difficult, there are numerous service roads and fire breaks that aren't on the map. I got off to a great start. After just .35 miles I was right back where I started. OK, that was easy to figure out. Went on the wrong trailhead a few yards away. So I started out again and this time I got on the right trail. Everything was going well for a little over a mile when I took a wrong turn. It came to a dead end in less than 1/4 mile so I ran back and got back on course. Shortly after that I made another wrong turn but since it connected with the correct route a little later I didn't know it until I ran the the third lap. But back to this one. I had some confusion but thought I had it right and was cruising along thinking I should be within a 1/4 mile of the start when I came out on a trail on the wrong side of the park. Somehow I was right back around the 1.5 mile mark. I back tracked a ways and then took another couple of wrong turns that finally at least got me back to the start. That 4.4 miles turned into 6.
frustrating but at least I was getting in some good running on some nice trails. I went out for lap three in the normal direction again hoping that I would find where I could have made a mistake. By now I was confident of most of the route but I still had some questions about it and was hoping to finally get it right. Thankfully I was able to clearly see this time where I had made the shortcut at a confusing intersection that was not on the map and I had no trouble the rest of the way. That lap measured right on 4.4. Reassuring to know my gps wasn't that far off. So I got in a nice 14.4 mile workout and had an enjoyable afternoon. I must say the trails are a bit more difficult than I remember but then everything seemed easier when I was 20 years younger. Lots of roots in several sections. Sandy in places and it's pretty thick in a few spots. No big hills but several shorter ones and some are steep. This is not a fast course by any means. Looking forward to the challenge next year ! Thanks Gene. glad you enjoy my ramblings. I hope to get back to Weymouth one more time before the race now that I finally know the route.